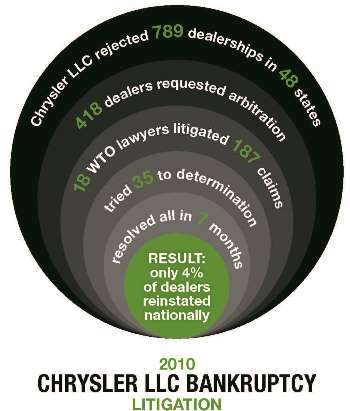 Co-managed nationwide response to 2010 Chrysler bankruptcy involving litigation with 418 dealers. As national trial counsel to Chrysler Group LLC ("New Chrysler"), Wheeler Trigg O'Donnell, along with the Boston office of WilmerHale, developed the national strategy to respond to 418 arbitration requests between January and July 2010. Because they threatened the viability of New Chrysler, the arbitrations were the dominant legal issue in 2010 for the manufacturer of Chrysler, Jeep, and Dodge vehicles. In a year characterized by bailouts and restructuring, the arbitrations also were closely monitored by the entire U.S. automobile industry. As part of the bankruptcy of Chrysler LLC ("Old Chrysler"), Old Chrysler rejected the dealer agreements of 789 dealers. In a sale of virtually all of Old Chrysler's assets, the dealer agreements were assigned to New Chrysler, the company that resulted from the June 2009 partnership of Chrysler and Italian automaker Fiat. In December 2009, the U.S. Congress passed a statute that provided the rejected dealers of the bankrupt Old Chrysler the right to demand arbitration from New Chrysler. This legislation was enacted despite the fact that the rejected dealers never were associated or had a contract or dealer agreement with New Chrysler. The resulting 418 arbitration requests involved closed-down dealers that operated under Old Chrysler in 48 states. By federal statute, the arbitrations had to be completed within seven months of the enabling legislation's enactment. This short time frame led to an unprecedented effort in completing discovery in hundreds of simultaneous matters in only a few months, coordinating and training dozens of trial teams, coordinating and training scores of company witnesses, and coordinating dozens of expert witnesses. The lead WTO attorneys, including Hugh Gottschalk, Steven Kelso, and Gwen Young, were responsible for: developing the strategic litigation plan, national theme, and theory for all arbitrations; creating briefing, witness examination, and argument templates and modules; coordinating local trial counsel; and developing expert witnesses and company witness preparation teams. The lead attorneys also directed the trial teams that litigated 187 of the arbitrations in the western, midwestern and southern regions of the United States. They oversaw the dozens of WTO lawyers and staff who were involved in preparing for and trying to a determination 35 of the arbitrations. The WTO partners who tried the arbitrations that resulted in determinations included the following: Scott Barker tried an arbitration in Colorado; Hugh Gottschalk tried two arbitrations in Ohio; Steven Kelso tried four arbitrations, including three in Colorado and one in Nevada; Kevin Kuhn tried an arbitration in New Mexico; Ray Martin tried three arbitrations in Iowa; Ed Stewart tried three arbitrations in Missouri; and Jack Trigg tried three arbitrations in Colorado. The arbitrations were completed within the mandated seven months. When the arbitration deadline had passed, only 32 of the 789 rejected dealers had been reinstated – a huge victory for Chrysler. Law Week Colorado named the WTO franchise team among its 2010 "Lawyers of the Year."